Objective: The aim of the present study was to evaluate the perioperative effect of magnesium infusion on blood sugar level in patients with diabetes mellitus undergoing cardiac surgery. Design: This was a double-blind randomized study. Setting: The study was conducted at cardiac center. Patients: The study included 122 adult patients. Intervention: Group M – The patients received a continuous infusion of magnesium sulfate (without a loading dose) at 15 mg/kg/h. The infusion rate was started 20 min before induction maintained during surgery and the first postoperative 24 h. The medication was prepared by adding 5 g magnesium sulfate in 50 ml syringe. Group C – The patients received equal amount of normal saline. Measurements: The monitors included heart rate, mean arterial blood pressure, central venous pressure, urine output, blood levels of magnesium, sugar, and potassium. Results: The blood sugar level and the required insulin significantly decreased with Group M than Group C (P < 0.05). There were minimal changes in the potassium level in Group M, but potassium decreased in patients of Group C (P < 0.05). The amount of urine output was too much higher in Group M than Group C (P < 0.05). The pharmacological and mechanical support significantly decreased with Group M than Group C (P < 0.05). The hospital and Intensive Care Unit length of stay significantly decreased with Group M than Group C (P < 0.05). Conclusion: The magnesium sulfate produced a better-controlled effect on the blood sugar level. It decreased the requirement of insulin infusion and minimized the changes in the blood level of potassium. Hyperglycemia is a frequent complication during cardiac surgery with cardiopulmonary bypass (CPB). The causes of hyperglycemia may be related to many factors; first: the reduced levels of blood insulin as a result of nonpulsatile flow during CPB and hypoperfusion of some vital organs such as the pancreas, thereby reducing the production and release of insulin by pancreas; second: the adsorption of insulin to the CPB circuit; and third: the insulin resistance. The aim of the present study was done to evaluate the perioperative effect of magnesium infusion on blood sugar level in patients with diabetes mellitus undergoing cardiac surgery. The primary outcome was the efficacy of magnesium infusion in reducing the blood glucose levels. A secondary outcome was the requirement for insulin infusion in addition to the safety of the study medication, which was assessed by the occurrence of any adverse events. Power analysis was performed using the Chi-square test for independent samples on the frequency of patients associated with elevated perioperative blood glucose levels because it was the main outcome variable in the present study. A pilot study was done before starting this study because there are no available data in the literature for the perioperative effect of magnesium infusion on blood sugar level in patients undergoing cardiac surgery. The results of the pilot study (16 patients in each group) showed that the perioperative blood sugar level increased in 31.25% of magnesium group and 56.25% of the control group. Taking power 0.8, alpha error 0.05, and beta 0.2, a minimum sample size of 61 patients was calculated for each group. After obtaining informed consent and approval of local ethics and research committee, a double-blinded randomized study included 122 diabetic patients undergoing cardiac surgery using CPB. The inclusion criteria were adult patients with diabetes mellitus, ejection fraction >40%). Exclusion criteria included patients with congestive heart failure, acute myocardial infarction, emergency, redo cases, malfunctioning artificial heart valve, obstructive cardiomyopathy, heart rate <50 bpm, pericardial disease, and renal or hepatic impairment. The patients were randomly allocated into two equal groups (n = 61 each). The concealment of allocation was done using random numbers generated through Excel. The study medications were prepared in 50 ml syringe and the infusion started by the staff nurse according to the study protocol and the anesthetist was blinded to the contents of the syringe and the name of the medication infused by the syringe pump. Group C– (Control group). The patients received equal amount of normal saline. For all patients and under local anesthesia, a radial arterial cannula and central venous line were inserted before operation to enable continuous hemodynamic monitoring. Induction was done by intravenous fentanyl (3–5 μg/kg), etomidate (0.3 mg/kg), and rocuronium (0.8 mg/kg). The anesthesia was maintained with oxygen/air (50%), sevoflurane (1%–3%), fentanyl infusion (1–3 μg/kg/h), and cisatracurium (1–2 μg/kg/min). CPB was established with cannulation of the ascending aorta and right atrium. Hemofiltration was done before weaning from CPB to induce hemoconcentration. At the end of surgical intervention, the patients were prepared for weaning from CBP. If there was difficulty to wean from CPB, pharmacological support (dopamine, epinephrine or norepinephrine, nitroglycerine) or mechanical support intra-aortic balloon pump (IABP) was started. During anesthesia, the elevated blood sugar (>10 mmol/L) was controlled by insulin infusion (insulin infusion was started 2 units/h and the dose was modified every 30 min), and if the blood sugar levels decreased below 10 mmol/L, the insulin infusion was discontinued. At the end of surgery, the patients were transferred to cardiac surgery Intensive Care Unit (ICU) with full monitoring. Hemodynamic monitoring included the heart rate, mean arterial blood pressure, a continuous electrocardiograph with automatic ST-segment analysis (leads II and V), central venous pressure, urine output, blood levels of magnesium, sugar, and potassium. Furthermore, the required pharmacological and mechanical support was collected. The values were serially collected at the following timepoints: T0: Baseline reading (before starting the administration of study medication); T1: Reading 15 min after induction; T2: Reading before CPB; T3: Reading 30 min after CPB; T4: Reading at ICU admission; T5: Reading 6th h after ICU admission; T6: reading 12th h after ICU admission; T7: Reading 24th h after ICU admission. Data were statistically described in terms of mean ± standard deviation, or frequencies (number of cases) and percentages when appropriate. Comparison of numerical variables between the study groups was done using the Student t-test for independent samples. Repeated measure ANOVA was used to see the effect of magnesium on the blood sugar levels at different follow-up intervals. For comparing categorical data, Chi-square test was performed. Exact test was used instead when the expected frequency is <5. P < 0.05 was considered statistically significant. All statistical calculations were done using computer program SPSS (Statistical Package for the Social Science; SPSS Inc., Chicago, IL, USA) version 15 for Microsoft Windows. 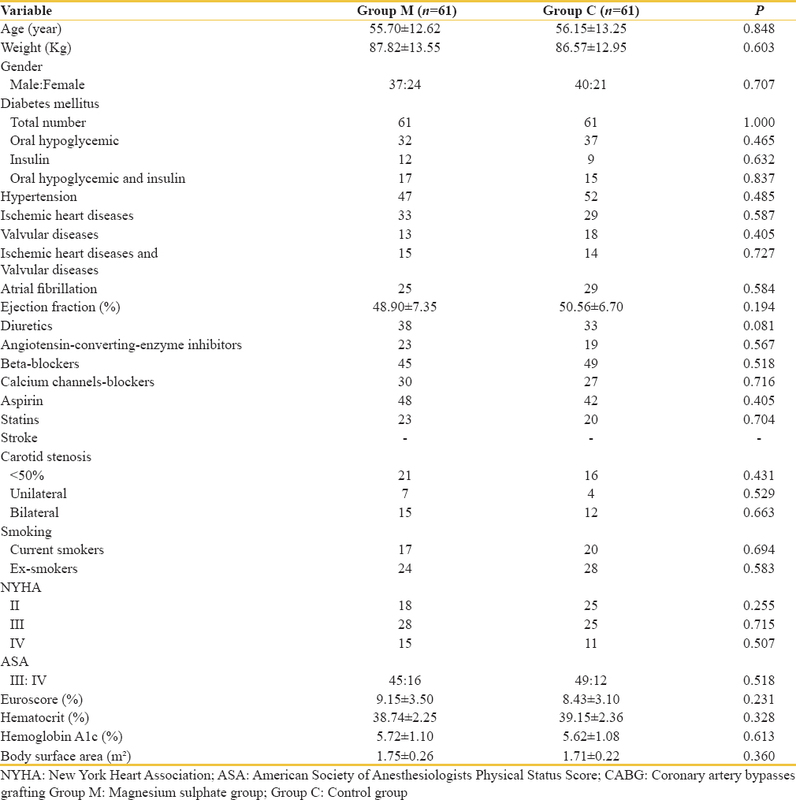 [Table 1] shows no significant differences regarding the demographic data, comorbidities, preoperative medications, New York Heart Association class, Euroscore, and the American Society of Anesthesiologists physical status score (P > 0.05). [Table 2] shows the changes in the blood levels of magnesium, potassium, and sugar in addition to the insulin requirement. There was no difference in the preoperative blood levels of magnesium, potassium, and sugar between the two groups (P > 0.05). After magnesium sulfate infusion, the blood magnesium level increased significantly in Group M than Group C and the difference between the two groups was statistically significant (P < 0.05). After induction, the blood sugar level increased in the patients of the two groups, but the increase was significantly lower in Group M than Group C (P < 0.05). Therefore, the number of patients who required insulin to manage the elevated blood sugar level was lower in Group M than Group C, and also the dose of insulin was lower in Group M than Group C (P < 0.05). 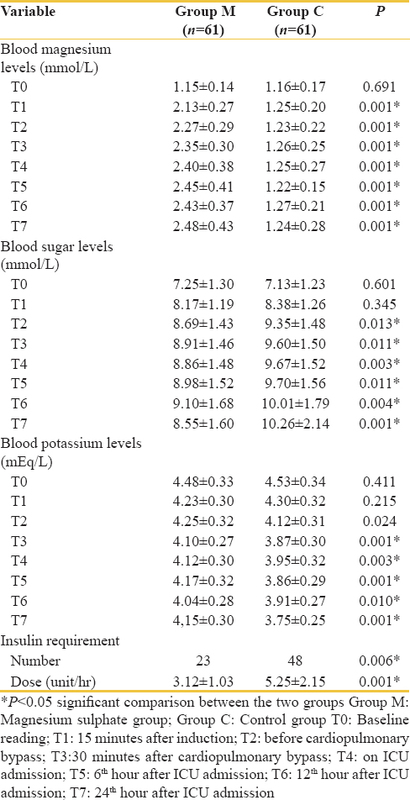 There were minimal changes in the blood level of potassium in Group M and a significant decrease in the potassium level in the Group C and the difference between the two groups was significant (P < 0.05). 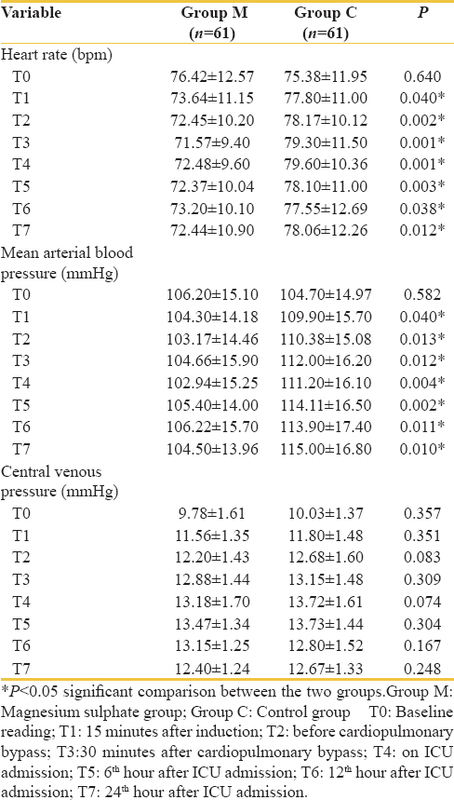 [Table 3] shows the changes in the heart rate, mean arterial blood pressure, and central venous pressure of patients during the procedure and through the first 24 h in the ICU. There was no significant difference in the preoperative heart rate, mean arterial blood pressure, and central venous pressure. After drug infusion (T1), the heart rate decreased in Group M and increased in patients of Group C and the difference between the two groups was statistically significant (P < 0.05). There were minimal changes in the mean arterial blood pressure in patients of the Group M and an increase in the mean arterial blood pressure in patients of Group C and the difference between the two groups was statistically significant (P < 0.05). There was no change in the central venous pressure of patients between the two groups (P > 0.05). [Table 4] shows the intraoperative data and outcomes of patients of the two groups. There was no difference in the CPB time, cross-clamping time, blood loss, transfused perioperative fluids, transfused packed-red blood cells, hematocrit value, pacing, and IABP between the two groups (P > 0.05). The volume of fluid removed by hemofiltration was lower in Group M than Group C (P = 0.016). The weaning from CPB was easier in patients of the Group M than the Group C. Patients of Group M needed smaller doses of pharmacological support (dopamine, epinephrine, norepinephrine, and nitroglycerine) than the Group C (P < 0.05). The incidence of postoperative arrhythmias (atrial fibrillation and ventricular extrasystole) was lower in the Group M than the Group C (P = 0.044 and P = 0.032, respectively). 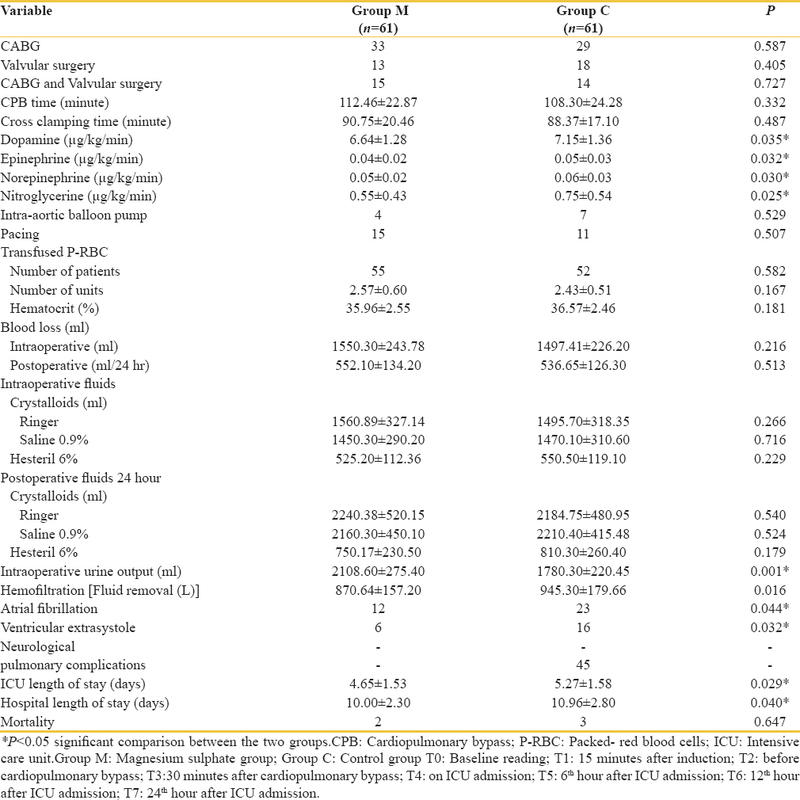 The amount of intraoperative urine output was higher in Group M than Group C (P = 0.001). The ICU and hospital length of stay were shorter in the patients of Group M than Group C (P = 0.029 and P = 0.040, respectively). There was no neurological or pulmonary complication in the patients of the two groups. There was no significant difference regarding the incidence of mortality between the two groups (P = 0.647). The present study showed that the perioperative magnesium infusion led to a better control of blood sugar level in patients with diabetes who underwent cardiac surgery and it decreases the requirement for insulin to manage the elevated blood sugar. Therefore, the controlled blood sugar and decreased insulin requirement minimized the change in potassium level and the incidence of arrhythmia. Furthermore, it decreased the requirement for pharmacological support for the blood pressure during and after weaning from the CPB. The decreased blood sugar level in Group M may be as a result of increased insulin sensitivity or the increased insulin production after magnesium sulfate administration, but the insulin level was not measured during the study and other studies support this opinion.,, Rosolová et al. reported that the blood insulin level increases with the elevated blood level of magnesium and also the study showed that the hypomagnesemia was associated with insulin resistance and glucose intolerance. Magnesium decreases the blood sugar levels through many mechanisms; (1) by improving the insulin response and action as a result of the increased affinity of insulin to its receptors;,, (2) it affects the insulin secretion from the pancreas; (3) It potentiates the insulin-mediated-glucose-uptake;,,, (4) it has a role in the regulation of glycogenolysis and glucose output in the liver; (5) it decreases the release of catabolic hormones such as catecholamines, thyroid hormone, and cortisol, that increase glycogenolysis and gluconeogenesis; (6) magnesium may directly affect the glucose transporter protein activity and help to regulate glucose translocation into the cell. Many studies showed that magnesium supplementation increased the insulin sensitivity and decreased the blood sugar level,,,,,,, but these studies were not done in cardiac surgery. Kieboom et al. showed that magnesium-regulating genes modify the diabetes risk through serum magnesium levels and the role of magnesium in the development of diabetes is mediated through insulin resistance. One study showed that low serum magnesium levels in children and adolescents with Type-1 diabetes mellitus are associated with an increased risk of poor glycemic control as measured by blood level of hemoglobin A1c, and another study showed that a significant relationship between the increase in serum and cellular magnesium and the insulin sensitivity. A study done by Galli-Tsinopoulou et al. showed that a higher magnesium intake reduces the risk of impaired glucose and insulin metabolism and progression from prediabetes to diabetes. Magnesium sulfate increased the urine output as a result of inhibition of the catecholamines and vasopressin release, therefore producing renal vasodilatation and increasing the renal blood flow and urine output,,, and this may increase the urinary excretion of glucose. Against the present findings, another study showed that magnesium replacement has no effect on the insulin resistance. The present study showed the level of potassium was maintained in Group M while decreased in Group C and this may be related to the decreased blood sugar, insulin infusion, and catecholamines infusion which decrease the intracellular shift of potassium and maintaining the level of potassium in Group M. While the increased blood sugar, insulin infusion and catecholamines infusion increase the intracellular shift of potassium and decreasing the level of potassium in Group C.
There are limitations to the present study. First, the blood insulin level was not measured as the kits were not available in the main laboratory during the study; second, small study populations of the present study; and third, limited researchers talking about the same topics as the present study to discuss these findings in details. The magnesium sulfate produced a better-controlled effect on the blood sugar level. It decreased the requirement of insulin infusion and minimized the changes in the blood level of potassium. The authors thank all staff nurses in the operative rooms, postanesthesia care unit, and Intensive Care Unit for their efforts and performance during the study. Herreros J, Berjano EJ, Sola J, Vlaanderen W, Sales-Nebot L, Más P, et al. Injury in organs after cardiopulmonary bypass: A comparative experimental morphological study between a centrifugal and a new pulsatile pump. Artif Organs 2004;28:738-42. Najmaii S, Redford D, Larson DF. Hyperglycemia as an effect of cardiopulmonary bypass: Intra-operative glucose management. J Extra Corpor Technol 2006;38:168-73. Nadler JL, Rude RK. Disorders of magnesium metabolism. Endocrinol Metab Clin North Am 1995;24:623-41. Paolisso G, Sgambato S, Gambardella A, Pizza G, Tesauro P, Varricchio M, et al. Daily magnesium supplements improve glucose handling in elderly subjects. Am J Clin Nutr 1992;55:1161-7. Ramadass S, Basu S, Srinivasan AR. SERUM magnesium levels as an indicator of status of diabetes mellitus type 2. Diabetes Metab Syndr 2015;9:42-5. Larsson SC, Wolk A. Magnesium intake and risk of type 2 diabetes: A meta-analysis. J Intern Med 2007;262:208-14. Kim DJ, Xun P, Liu K, Loria C, Yokota K, Jacobs DR Jr., et al. Magnesium intake in relation to systemic inflammation, insulin resistance, and the incidence of diabetes. Diabetes Care 2010;33:2604-10. Dong JY, Xun P, He K, Qin LQ. Magnesium intake and risk of type 2 diabetes: Meta-analysis of prospective cohort studies. Diabetes Care 2011;34:2116-22. Classen HG, Gröber U, Kisters K. Drug-induced magnesium deficiency. Med Monatsschr Pharm 2012;35:274-80. Inoue S, Akazawa S, Nakaigawa Y, Shimizu R, Seo N. Changes in plasma total and ionized magnesium concentrations and factors affecting magnesium concentrations during cardiac surgery. J Anesth 2004;18:216-9. Manrique AM, Arroyo M, Lin Y, El Khoudary SR, Colvin E, Lichtenstein S, et al. Magnesium supplementation during cardiopulmonary bypass to prevent junctional ectopic tachycardia after pediatric cardiac surgery: A randomized controlled study. J Thorac Cardiovasc Surg 2010;139:162-900. Murakami M, Ishizuka J, Sumi S, Nickols GA, Cooper CW, Townsend CM Jr., et al. Role of extracellular magnesium in insulin secretion from rat insulinoma cells. Proc Soc Exp Biol Med 1992;200:490-4. Dominguez LJ, Barbagallo M, Sowers JR, Resnick LM. Magnesium responsiveness to insulin and insulin-like growth factor I in erythrocytes from normotensive and hypertensive subjects. J Clin Endocrinol Metab 1998;83:4402-7. Rosolová H, Mayer O Jr., Reaven GM. Insulin-mediated glucose disposal is decreased in normal subjects with relatively low plasma magnesium concentrations. Metabolism 2000;49:418-20. Resnick LM, Gupta RK, Gruenspan H, Alderman MH, Laragh JH. Hypertension and peripheral insulin resistance. Possible mediating role of intracellular free magnesium. Am J Hypertens 1990;3:373-9. Barbagallo M, Dominguez LJ. Magnesium and type 2 diabetes. World J Diabetes 2015;6:1152-7. Günther T. Magnesium in bone and the magnesium load test. Magnes Res 2011;24:223-4. Saris NE, Mervaala E, Karppanen H, Khawaja JA, Lewenstam A. Magnesium. An update on physiological, clinical and analytical aspects. Clin Chim Acta 2000;294:1-26. Takaya J, Higashino H, Kobayashi Y. Intracellular magnesium and insulin resistance. Magnes Res 2004;17:126-36. Fagan TE, Romani A. Activation of Na(+)- and Ca(2+)-dependent Mg(2+) extrusion by alpha(1)- and beta-adrenergic agonists in rat liver cells. Am J Physiol Gastrointest Liver Physiol 2000;279:G943-50. Finnerty CC, Mabvuure NT, Ali A, Kozar RA, Herndon DN. The surgically induced stress response. JPEN J Parenter Enteral Nutr 2013;37:21S-9S. Veronese N, Watutantrige-Fernando S, Luchini C, Solmi M, Sartore G, Sergi G, et al. Effect of magnesium supplementation on glucose metabolism in people with or at risk of diabetes: A systematic review and meta-analysis of double-blind randomized controlled trials. Eur J Clin Nutr 2016;70:1354-9. Song Y, He K, Levitan EB, Manson JE, Liu S. Effects of oral magnesium supplementation on glycaemic control in type 2 diabetes: A meta-analysis of randomized double-blind controlled trials. Diabet Med 2006;23:1050-6.
de Lordes Lima M, Cruz T, Pousada JC, Rodrigues LE, Barbosa K, Canguçu V, et al. The effect of magnesium supplementation in increasing doses on the control of type 2 diabetes. Diabetes Care 1998;21:682-6. Simental-Mendía LE, Sahebkar A, Rodríguez-Morán M, Guerrero-Romero F. A systematic review and meta-analysis of randomized controlled trials on the effects of magnesium supplementation on insulin sensitivity and glucose control. Pharmacol Res 2016;111:272-82. Hruby A, Guasch-Ferré M, Bhupathiraju SN, Manson JE, Willett WC, McKeown NM, et al. Magnesium intake, quality of carbohydrates, and risk of type 2 diabetes: Results from three U.S. Cohorts. Diabetes Care 2017;40:1695-702. Hruby A, Meigs JB, O'Donnell CJ, Jacques PF, McKeown NM. Higher magnesium intake reduces risk of impaired glucose and insulin metabolism and progression from prediabetes to diabetes in middle-aged Americans. Diabetes Care 2014;37:419-27. Kieboom BC, Ligthart S, Dehghan A, Kurstjens S, de Baaij JH, Franco OH, et al. Serum magnesium and the risk of prediabetes: A population-based cohort study. Diabetologia 2017;60:843-53. Paolisso G, Barbagallo M. Hypertension, diabetes mellitus, and insulin resistance: The role of intracellular magnesium. Am J Hypertens 1997;10:346-55. Galli-Tsinopoulou A, Maggana I, Kyrgios I, Mouzaki K, Grammatikopoulou MG, Stylianou C, et al. Association between magnesium concentration and HbA1c in children and adolescents with type 1 diabetes mellitus. J Diabetes 2014;6:369-77. Herroeder S, Schönherr ME, De Hert SG, Hollmann MW. Magnesium – Essentials for anesthesiologists. Anesthesiology 2011;114:971-93. Do SH. Magnesium: A versatile drug for anesthesiologists. Korean J Anesthesiol 2013;65:4-8. James MF, Cronjé L. Pheochromocytoma crisis: The use of magnesium sulfate. Anesth Analg 2004;99:680-6. Lima de Souza E Silva Mde L, Cruz T, Rodrigues LE, Ladeia AM, Bomfim O, Olivieri L, et al. Magnesium replacement does not improve insulin resistance in patients with metabolic syndrome: A 12-week randomized double-blind study. J Clin Med Res 2014;6:456-62. Weisberg LS. Management of severe hyperkalemia. Crit Care Med 2008;36:3246-51. DeFronzo RA, Felig P, Ferrannini E, Wahren J. Effect of graded doses of insulin on splanchnic and peripheral potassium metabolism in man. Am J Physiol 1980;238:E421-7. Moratinos J, Reverte M. Effects of catecholamines on plasma potassium: The role of alpha – And beta-adrenoceptors. Fundam Clin Pharmacol 1993;7:143-53.